This challenge features cool colors to inspire you — Sno Cone, Blu Raspberry, Limeade, and Grout Gray. The cool colors of Color Challenge 50 lend themselves to water and foliage. 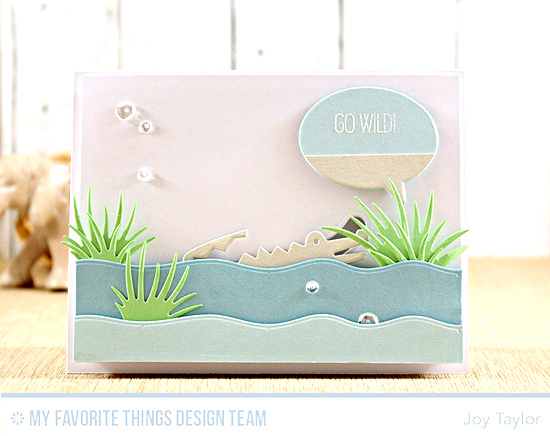 Joy creates a superb slider card with the Jungle Friends stamp set and Die-namics and our inventive Surf & Turf Die-namics. I'd rather not have an alligator pounce on me, no matter HOW cute he is! A pretty blue sky and sweet flowers dotting the landscape make for an adorable design. I love how Kimberly stamped some clouds on the Sno Cone panel and also stamped them on Grout Gray. 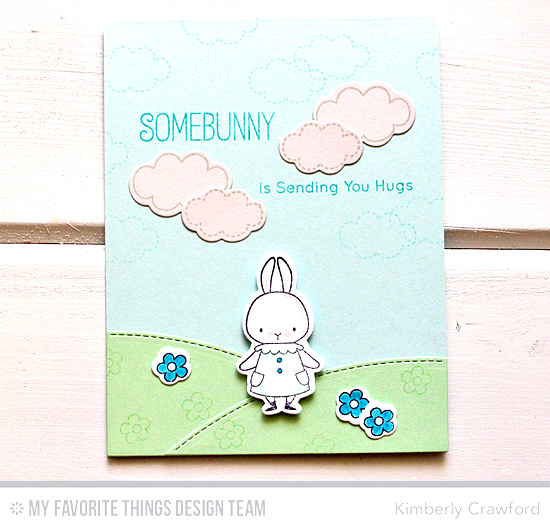 Somebunny is sure to love this card! Congratulations, KomMa-Wiebke! You are the randomly selected winner of the MFT Color Challenge. You can view all the entries from the last challenge HERE. You have until Wednesday, August 10th, at noon EDT to add your link and be eligible for the prize of up to $20 in MFT Cash. Winners are chosen at random, so everyone has a chance! The prize is a $15 Gift Voucher to My Favorite Things, but if you use MFT stamps and/or dies in your project, you’ll receive an extra $5.